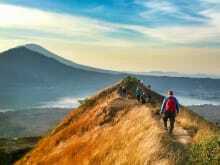 Our trekking agency, founded in 2006 is specialized in Batur and Agung Trekking. You will start Batur's hike from a private path, with the best guides on the island. They are all very qualified and English speakers. By booking with us, we guarantee you that your hike will be the highlight of your holidays ! I got picked up on time at 2:30am from Ubud, the driver didn’t mind all passengers fell asleep. When I met the guide, he was so attentive and make sure all of us doing fine till the spot. I was there join with a group of 3 person. One of girl and me unable to walk fast. The guide was walking pretty fast. The guide did hold and support two of us sometimes. Made me feel safe. The breakfast (eggs, toast, and chocolate bar) had provided were great. But drink need to be paid in extra. They will provide seating mattress if the benches are wet. The only think I don’t like of my guid is he smoke. I was busy gasping for breath while hike uphills. He likes smoking during resting points and on the top of the mountain. His secondhand smoking does affect me. I had booked hiking pole and received confirm letter from the team. However, I didn’t get one one the day. It was really good. Good guide !